Sushi at Izakaya-Kai in Kona. 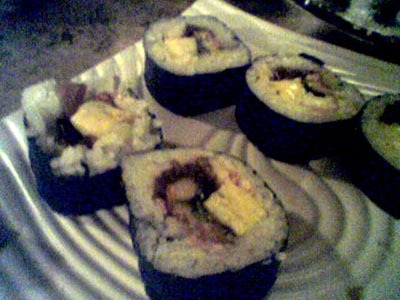 This is my maki sushi pieces that I couldn’t finish, eel, shrimp, egg and other stuff that I’m not sure what it was. Though tasty Renata, Andrea and myself had already had a tofu dish that had shaved bonita fish on it that was wiggling around like a heap of worms…yummy. I think it was the heat that made the pieces move. Also a few more other sushi dishes along with some sake. 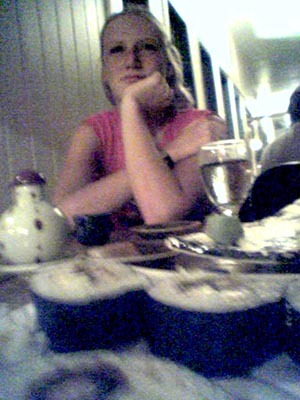 Andrea slows down after having salad, tofu, sushi and sake. 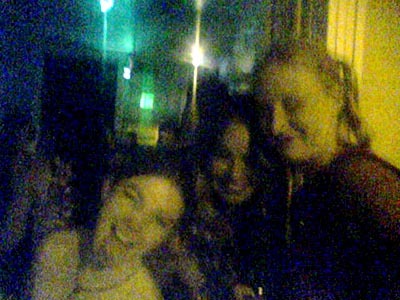 Yet another fuzzy cameraphone image of Renata, Carolyn and Andrea this time at Ocean’s Bar. The place was packed.